The Fiat Spider was built for almost 20 years, and no matter which way you look at it, it's not hard to see why. Despite lacking Pininfarina's usual swoopy curves and flowing lines, we still consider it one of the Italian design houses best designs, even when compared with its Alfa Romeo Spider cousin. That's because it's held up so well, even against other iconic stylistic exercises from the era, like the MG Midget. The front is ever-so-slightly higher, the rear ever-so-slightly-longer, and the brightwork is ever-so-slightly brighter, making the total package really come together quite nicely. But there's a reason you don't see too many Fiats, let alone Fiat Spiders, around anymore (the new 50o aside, of course). That's because they were plagued by reliability issues, even when brand spanking new, that doomed them in the eyes of their contemporary car buyers. 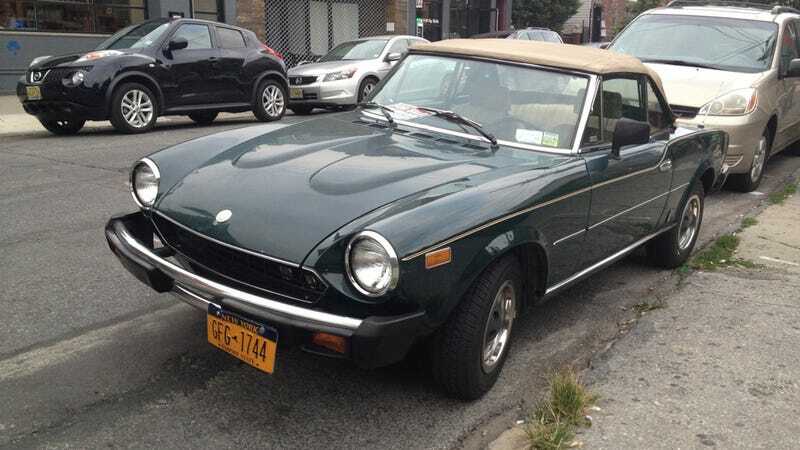 And even if you buy it in relatively good condition, like the one you see here, it can bite you if you don't know what you're doing and you take it to a mechanic that specializes in old Italian cars every couple of months. But that's the other joy of Fiat Spider ownership. They're incredibly simple, making them incredibly simple to work on, giving you that true "old car ownership" experience. And in a day and age when the Youths are flocking to places like Williamsburg, Brooklyn, desperately searching for a sense of authenticity, what's more authentic than that? And also, holy crap am I in love with that steering wheel.